This trail not only provides a big dividend of scenery for a moderate outlay of exertion, but it is easily accessible as well. From the ample parking lot at its trailhead, the Doe Mountain Trail switchbacks directly up the north side of this low, flat-topped Mesa. As you climb, you'll want to take time out to enjoy the excellent views of the surrounding countryside. A layer of erosion resistant cap rock has given Doe Mountain its classic mesa shape and provides hikers with a great platform from which enjoy the panoramic view. From this 400 foot high perspective, you can see a number of the Sedona Red Rocks Country's more prominent landmarks . You'll see Bear, Maroon, and Wilson mountains, Loy, Boynton, and Secret Canyons, Chimney Rock, and the Cockscomb to name a few. Sedona is visible to the east and off to the south, Munds Mountain and Sycamore Pass mark the location of Sycamore Canyon and the Verde Valley. Location: About 36 miles from Flagstaff (an hour and a half travel time); 5 miles (15 minutes) from Sedona. All roads are paved. 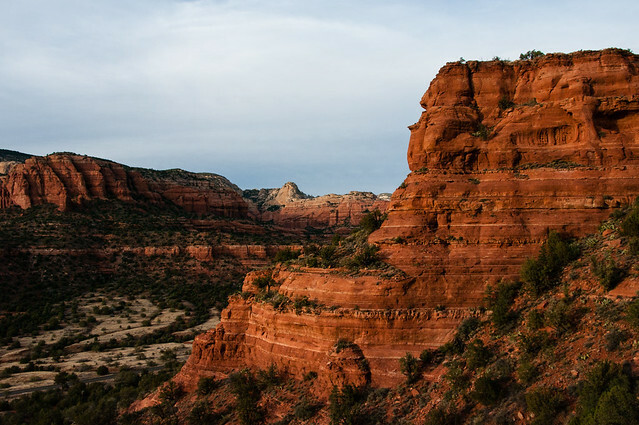 Access: Drive 27 miles south from Flagstaff to Sedona on US 89A. Continue through Sedona to Dry Creek Road at the west end of town. Turn north on Dry Creek Road (FR 152C) three miles to the Boynton Canyon intersection then left on FR 152C about a mile to the trailhead. Click map graphic for larger view.